Apple will introduce a 3G version of the iPhone next year, according to AT&T Inc. Chief Executive Officer Randall Stephenson. “You’ll have it next year,” said Stephenson. He said he didn’t know how much more the new version will cost than the existing model, which sells for $399. Apple Chief Executive Officer Steve Jobs “will dictate what the price of the phone is,” he said. 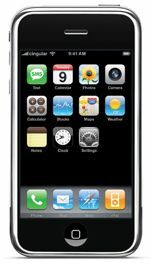 Jobs hopes to sell 10 million iPhones worldwide in 2008, which would give Cupertino, California-based Apple 1 percent of the mobile-phone market. Apple had sold 1.4 million handsets through the end of September. If history is any example, the 3G iphone will be expensive, it will be awesome and we will upgrade.